The economics of oil … continued. A couple of week’s ago, I posted The economics of oil … suggesting that countries such as Saudi Arabia were operating below breakeven with oil @ $40 per barrel. While technically correct, several loyal readers schooled me on the difference between “economic breakeven” and “fiscal breakeven”. Hourly earnings up, but household income down … say, what? Great analysis by Prof. Mark Perry (AEI Scholar) … entire analysis is worth reading … here’s the essence of the argument. Question: It’s oft-reported that household income has been falling … but, digging into the data, hourly earnings have been increasing. According to Prof. Perry’s analysis, the answer lies in “mix” – the composition of households …. In light of the oil glut, Exxon has announced that it’s moth-balling some rigs and cutting capital expenditures. That fits a bigger trend … supply high, demand slow, prices down, production down. The value of a college degree … and, the drag of not having one. 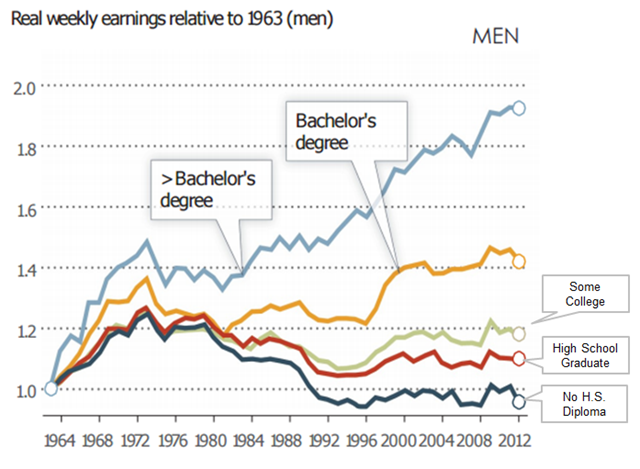 Since the mid-60s, the real wages of a worker holding a bachelor’s degree have increased by about 40%. That sounds formidable, but even it is only about 1.3% per annum. During the same period, real wages for high school grads only increased about 15% … about 1/4% per annum. And, real wages for workers without a high school degree stayed flat … or arguably, fell. Powerball economics … and, oh yeah, about regressive taxes. Last night’s Powerball payoff was $1.6 billion. 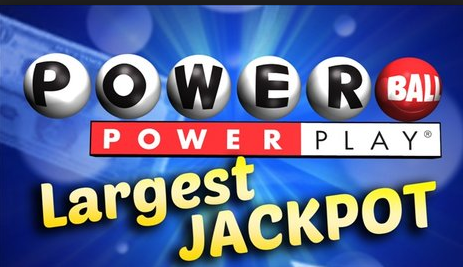 Even at Powerball’s ridiculous odds – 1 chance in 250 million of winning – that’s a good bet statistically, right? Let’s go thru some math. In econ-speak, the nominal expected value of the payoff is $1.6 divided by 250 million … about $6. Since each PB ticket costs $2 … and $6 is way greater than $2 … that’s a good bet, right? Wages, productivity … and women. Hot topic these days is how wages have remained stagnant for a long, long time … while productivity – think output per labor-hour has soared. The political explanation: over-sized paychecks to greedy CEO’s have been draining the coffers. That may be a part of the answer, but I bet it’s statistically insignificant. I haven’t run the nums, but I bet that zeroing all CEO compensation wouldn’t budge the below chart. In addition to greedy CEO’s, the batch of suspects usually includes: automation (shifting jobs to machines & computers), globalization (moving jobs to low wage areas), immigration (an influx of cheap labor). In other words, the supply of labor and the demand for labor are out of whack. 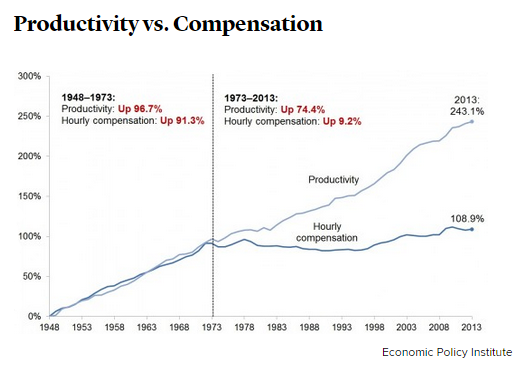 But nobody seems to ever mention a pretty obvious bump in the supply of labor …. More: Is the high cost of childcare coaxing women out of the workforce? Note that from 1965 to about 1999, men (blue line) were steadily leaving the labor force. But, during that period women (red line) were entering at a faster clip than the men were dropping out … so total LFPR (black line) continued to inch up. Around 1999, women’s LFPR flattened out … but men continued to leave the workforce … so the total LFPR peaked and started to creep down. 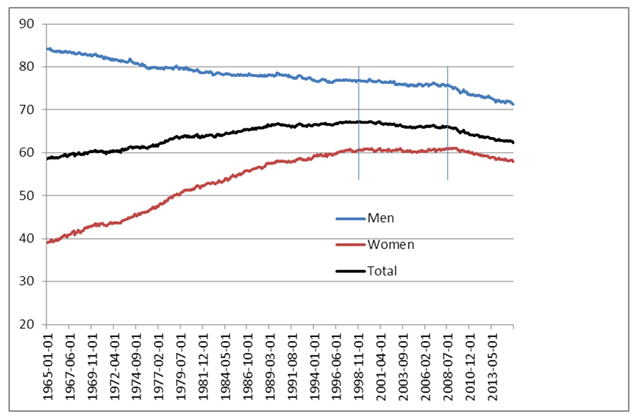 Since 2008, both men and women have been leaving the work force, so the total LFPR has steepened its decline. But, men are leaving at a slightly faster rate than women. And, we posted the results of a study indicating that women’s LFPR in the U.S. is low relative to other countries … and declining at a time that it’s increasing in other countries. Pundits attribute the higher LFPRs in other countries to more flexible work hours and government subsidized childcare. Is the high cost of childcare coaxing women out of the workforce? One of the biz show pundits made an off-hand remark that he thought much of the recent decline in labor force participation rates was at least partially traceable to women dropping out of the workforce because of the high cost of childcare. Plausible explanation that piqued my trust but verify interest, so I did a little digging. Let’s start with the big picture : The total labor force participation rate (LFPR). Note that the history breaks into roughly 3 distinct eras. From 1965 (as far back as I looked) until about 1990, the LFPR increased by about 8 percentage … almost a straight line, trending up. Then, coincident to the 1990 recession, the LFPR essentially flat-lined with some bouncing around between 66% and 67%. Since the 2008 financial crisis and the LFPR has dropped around 4 percentage points … not quite half of the 1965 to 1990 gain. Splitting the chart by gender is where things start to get interesting. Nums: Why are economists so bad at forecasting? The crux of their argument: the Fed has a clear recent tendency to mis-forecast economic growth … not by a little, by a lot … forecasting almost twice as rapid growth as is ultimately realized. For example, in 2009 the Fed was predicting 4.2 percent growth in 2011. But then in 2010 it revised that down to 3.85 percent growth. And in 2011 they revised it further to 2.8 percent growth. And when all was said and done, the economy only grew about 2.4 percent that year. 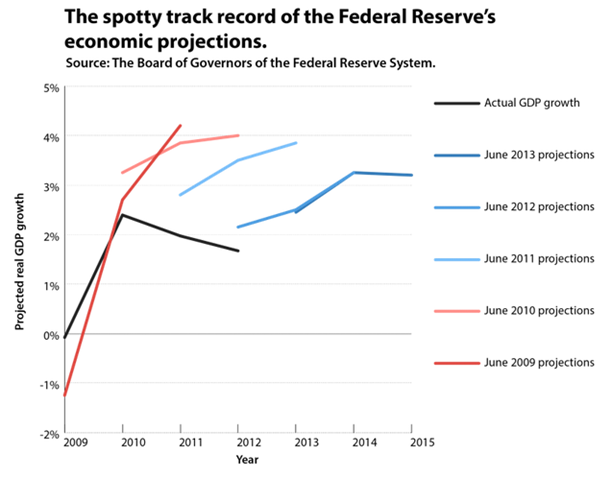 The Fed projected growth almost twice as fast as what actually happened. A lot of chatter over the weekend about how President Obama’s economic policies are – after 6 years — humming. More than 250,000 more people were employed … but interestingly, the unemployment rate inched up as the labor force participation rate increased a bit. Earlier this week, we looked at one of the no-BS economic measures: household income. Adjusted for inflation, median household income dropped 8% during the recession … and has been flat after bottoming out a couple of years ago. That means that the median real household income is still down 8% from the pre-recession peak. The drop in median household income has come despite a steady increase in average hourly wages … they’re up about 10% since the official end of the recession. Cheap Tricks … err, make that cheaper tricks. The Economist – a reputable publication — recently reported the results of a groundbreaking economic analysis. What explains the 30% drop in prices? More on “liberation from the burden of work” … say what?. Last week, we pointed out that the 288,000 jobs gain in June wasn’t all that it was cracked up to be since full-time employment declined by over 500,000 and part-time employment increased by almost 800,000. I thought the spike in part-time employment was a bad thing … a drift to a part-timer economy. Nums: Why’s the Fed so bad at forecasting? More: Why Fed economic forecasts are bad …. Earlier this week we posted Nums: Why’s the Fed so bad at forecasting? Complexity makes it hard to to pin down cause & effect. Forecasts often reflect political bias … pro and con. Based on revised data, the economy grew at a 1.8% annual rate in the first quarter, well below previous estimate of 2.4% growth. The biggest change was a cut in the government’s estimate of consumer spending which is more than 70% of the economy. Consumer spending growth dropped to 2.6% from 3.4% growth. The revision — .6% – may initially sound like loose change, but it’s a 25% miss. So, economic models that operating on the original (higher) estimate have a starting point that is off by 25%. The error compounds over time. It’s a version of what theorists call chaos theory … how a seemingly small variation at a starting point can compound into a major effect over time. Side note: And, in the “new normal” economy, the downward revision was good for the stock market since it puts pressure on the Fed to continue pumping money into the economy … the bulk of which is flowing straight to the stock market. 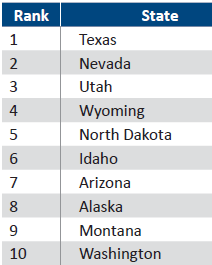 Last week, the American Legislative Exchange Council (ALEC) – a right-leaning economic analysis group – released its 6th annual report on state economic performance. Notice anything common across those states? 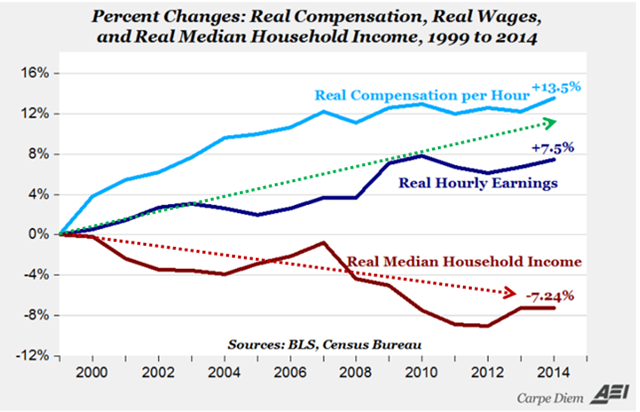 Bummer: The middle class plight … in 2 charts. The central conclusion: the rich have gotten richer and the middle class has gotten crushed. Upper and lower income groups have both increased by about 5 percentage points of the population mix. In other words, the percentage of middle class folks – earning from 2/3s to twice the median income – has dropped by 10 percentage points. Econ: Better to be accredited and wrong … or not accredited and right? First. my stake in the game: I consider myself an economist … at heart and by schooling … majored in econ … grad work in applied econ … worked for awhile doing econometrics. Econ still permeates my marketing strategy work. Here’s the story and my take on the question …. 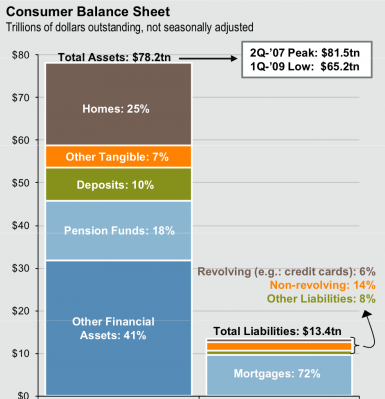 Econ: How much of consumers’ assets are in their home? Financial assets are more than half. In nominal terms, the aggregate consumer balance sheet has just about fought its way back to pre-crash levels. So, why does it feel so bad? Punch line: Forecasts of U.S. corn and soybean yields are set to have a major impact on the prices we pay for everything from processed food to beef and poultry. The Agriculture Department lowered its forecast of corn and soybean yields as record heat continued to batter crops in the Midwest. The new data suggested that customers would pay more at the grocery store next year as the prices of corn and soybeans — major ingredients in processed food, animal feed and biofuels — rise to record levels. The United States is the world’s largest exporter of corn and soybeans. 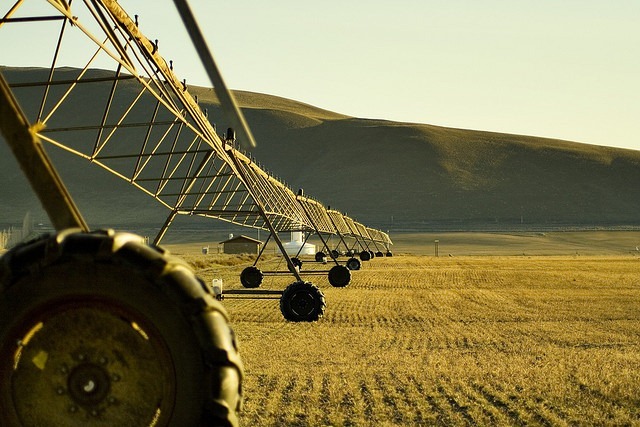 The report said exports of both crops would be substantially lower than last year, which could have a devastating effect on countries like China and Mexico, which depend heavily on American exports. The report said beef and poultry production was expected to increase this year as livestock producers culled or sold their herds because of higher feed costs. But prices for beef and poultry are expected to rise 4 to 5 percent next year. The alarming increasing in the saving rate … say, what? One of the drags on the economy is that folks have tried to deleverage – i.e. pay down debts – and are saving more. Recently, I’ve seen several articles talking about the “alarming” spike in the savings rate. Strikes me as odd since, in the past, saving was considered a good thing (you know, savings is what funds investment which drives the economy) … and there was hand wring that folks were spending like drunken sailors and weren’t saving enough. 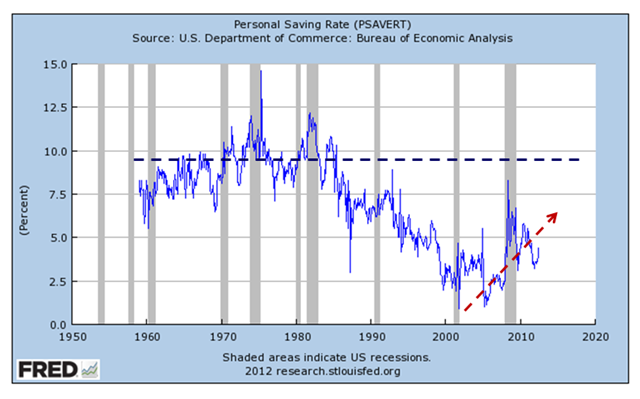 Yes, the savings rate has been increasing since troughing around 2005.But – and it’s a big BUT – the saving rate is still about 5 points lower than it was in the 1970s and 1980s … when there was concern that we weren’t saving enough. So, if you think the current rate is alarming, expect to be more alarmed as we bounce back to the old normal. Hey, Millennials: Lower your expectations … say, what? First, an HBR blast which argued that the best way to reduce stress is to lower your expectations. Don’t expect much out of life, your friends & family or your co-workers. Then came a Newsweek article about the economic jam Millennials are in … with student loans, a bad job market, etc. Median net worth of people under 35 fell 37 percent between 2005 and 2010; those over 65 took only a 13 percent hit. The wealth gap today between younger and older Americans now stands as the widest on record. The median net worth for younger-age households is a paltry $3,662, down 68 percent from a quarter century ago. OK, reason for the Millennials to despair, for sure. There’s a growing notion among economists that the new generation must lower expectations. They are understandably more amenable to government-mandated income redistribution … since so few young people pay much in the way of taxes. All I can say is: YIPES. Julia, meet Henry … a High Earner (who’s) Not Rich Yet … sound familiar? A couple of months ago, the Obama campaign unveiled its “Life of Julia,” a website detailing “how President Obama’s policies help one woman over her lifetime” … by showering her with the benefits of the entitlement state, from Head Start to student loans to Obamacare. In response, the Weekly Standard has resurrected H.E.N.R.Y. — marketing slang, first used in Fortune in 2003, for High Earners who are Not Rich Yet. Henrys run households with annual incomes between $100,000 and $250,000. There are about 21 million of them. Henrys make up the overwhelming majority of affluent consumers, who account for 40 percent of consumer spending — which in turn is 70 percent of economic activity. Without the Henrys’ getting and spending, the U.S. economy would be much poorer. One can find Henry and his family in the affluent suburbs and exurbs surrounding cities like Washington, D.C., New York, and Los Angeles, or in the counties of suburban Dallas-Fort Worth, Houston, Raleigh, and Philadelphia. He owns his house. He plans to send his children to college. He shops at Target, Saks, Coach, Restoration Hardware, Banana Republic, and, on special occasions, Tiffany. The Obama years have not been kind to Henry. His economic fortunes have bobbed up and down. He’s never been flush, but he’s never been broke, either. So much to him seems dependent on forces outside his control — whether the Fed engages in another round of quantitative easing, whether the eurozone survives for another week. Henry is the true swing voter in this Presidential election. 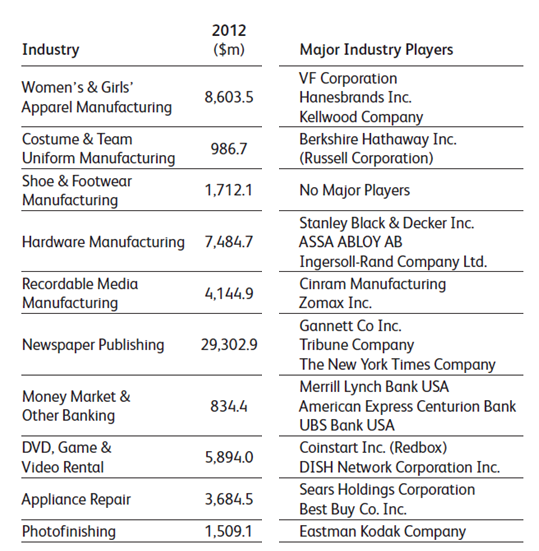 Winners & losers: Which industries are growing fastest? dying fastest? Inflation is in check … oh, really. Punch line: The Feds are reporting that inflation is in check at just over 3%. An independent assessment puts the number over 8% … more credible given what’s been happening on supermarket shelves. On the face of it, the government measure of consumer prices, the CPI, is just mildly alarming — with the government estimating prices to be rising at a 3.1 percent annual rate. But as anyone who pays the bills or does the household grocery shopping knows, a government-reported 3.1 percent inflation rate is laughably low. Bought cereal or mac and cheese for the kids lately? If so, you’re aware of the near double-digit increase in prices in the supermarket aisles. So what is the true inflation rate? The folks at the American Institute of Economic Research have resurrected the idea. Their Everyday Price Index (EPI) strips away the cost of big-ticket items, like homes and cars, and looks at the cost of things that consumers encounter on a daily or monthly basis, such as groceries, prescription medicine, and telephone and cable bills. By that measure, the Everyday Price Index shows inflation galloping ahead at an 8.1 percent annual rate. As far back as July, 2009, the HomaFiles is on record as saying that the economic recovery would be slow and delayed for reasons beyond pure economics. That CEOs would be reluctant to hire as long as the Administration was punitively anti-business. The bottom line: businesses will resist government policies passive aggressively. Fewer jobs will get added back than history would suggest, and those that get added back will materialize later than past patterns. Businesses will add jobs as a last resort rather than trying to build capacity ahead of the economic growth curve. Why should companies increase their costs and risks any more than is absolutely necessary ? 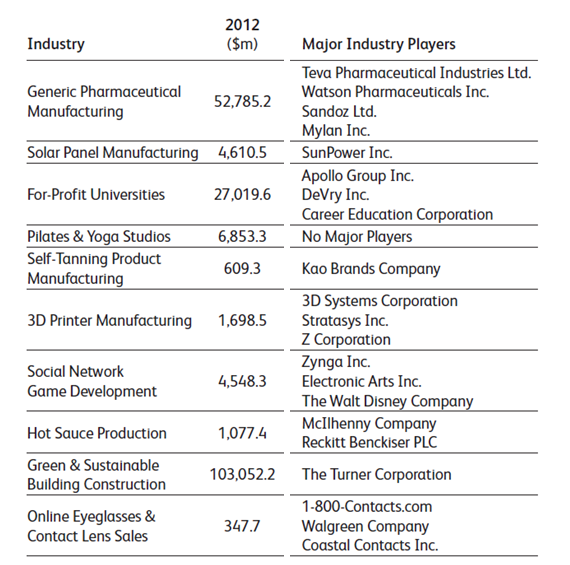 Companies will continue to off-shore jobs, but will be more clever and clandestine about it, e.g. by vertically disintegrating and simply buying goods and services from 3rd parties. Given the Administration’s anti-corporate rhetoric, actions, and proposed game-changing rules, I doubt that many CEOs will be taking on added costs and risks to boost the administration. More likely, they will let unemployment continue to creep up, and will slow roll the process of rehiring. Corporate chieftains will sit back and watch the President squirm. My view wasn’t really original thinking. It was simply what I was hearing privately from senior biz execs. Well, a couple of years later, the argument seems to be catching some traction. When Obama leaves office, there will be a sense of psychological release in the business community that will lead to a far greater “stimulus” than printing more money. the country is still growing, still needs new homes, more food, and more energy. We are not a shrinking nation with the demographic crises of a Europe or Russia. Soon the mounting pressure will be released by a new change in government and we will see a recovery that should have occurred more than two years ago when the recession officially “ended” in June 2009 — only all the more enhanced due to its delay. If I were a GOP President-elect, I’d call in the business movers & shakers … tell them that I’ll be working feverishly to support business … and ask them to give the benefit of the doubt and to start making decisions “at the margin” – e.g. an extra job here or there – to move the economy ahead. Not dumb stuff – just some decisions at the margin. Suddenly, there would be a virtuous cycle. Punch line: Netflix got into a hole by initially giving away its video streaming offerings … in essence, pricing based on marginal cost. Netflix tried to build their streaming video service by giving it away for free, as an add-on to their snail-mail service. This was a good way to add customers. But the history of the internet indicates that once you convince people something is supposed to be free, or close to it, you will have a devilishly hard time getting them to pay for it. People decided that they were supposed to be able to stream unlimited movies for free. This never made any sense; people were confusing the marginal cost with the average cost. You can always get a sweet deal if you are the customer who gets marginal cost pricing. Medicare does this — reimburses hospitals at above their marginal cost, but below their average cost, so that private insurers have to pick up most of the hospital overhead. European countries do this with prescription drugs: reimburse above the marginal cost of producing the pills, but below the total cost of developing the pills, so that the US has to pick up most of the tab for drug development. The problem is that as voters and as customers, we often get the notion that marginal costing can be extrapolated to everyone. So liberal policy wonks want to save money by putting everyone on Medicare, or some equivalent program that uses the government’s monopsony pricing power to get lower prices for everyone. Everyone cannot be the marginal cost consumer. Someone has to cover things like overhead and development costs. What should the GOP do re: O’s plan? The GOP-led Congress should draft and pass the “Barack Obama Stimulus Act of 2012 (aka. “American Jobs Act”) containing substantially all of the program that the Presidential teleprompter channeled through Obama. First, let’s acknowledge that the money will be a complete waste. There’s no reason to expect that Son-of-Stimulus will be any more successful than its predecessor. And, I’m assuming that the price tag really is $450 billion – chump change in this era of reckless spending that rewards irresponsibility and mortgages the future…. especially since the President promised that it would be paid for (yeah, right). The biggest political downside (to the GOP and the country) is that Obama will have a $450 billion election year slush fund to sprinkle across his constituencies – unions, blue-state governments, etc. 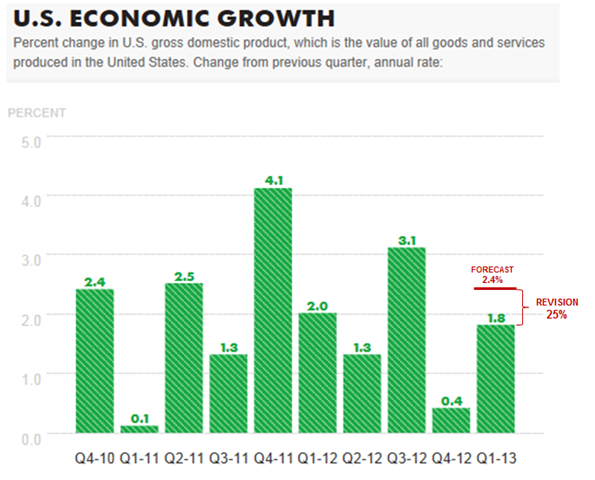 But, passing Stimulus Deux would clearly put the economic recovery — or lack thereof — on Obama’s shoulders. If it turns the economy around, Obama gets the credit. That’s fair. If it bombs, Obama loses his major campaign pitch: the GOP tied my hands. He’d be left with the silly claim: “woulda been worse, I saved you from Armageddon again”. I say pass it and sit back. If it works, we have an economic burst. If it fails, we get a president who understands business and economics. For the country, it’s a win either way. “History is going to say the black middle class was decimated” over the past few years. For many in the black community, job loss during this recession has knocked them out of the middle class and back into poverty. In 2004, the median net worth of white households was $134,280, compared with $13,450 for black households. By 2009, the median net worth for white households had fallen 24 percent to $97,860; the median net worth for black households had fallen 83 percent to $2,170. Blacks are overrepresented in state and local government jobs that are being eliminated because of massive budget shortfalls. Since 2009, the overall unemployment rate has fallen slightly, while the black unemployment rate has risen from 14.7 to 16.2 percent — The highest rate since the government began keeping track in 1972. Only 56.9 percent of black men over 20 were working, compared with 68.1 percent of white men. The college-educated unemployment rate is 3.9 percent for whites and 7 percent for blacks. Nearly 8 percent of African Americans who bought homes from 2005 to 2008 have lost them to foreclosure, compared with 4.5 percent of whites. Ken’s Take: No question, the recession has hit the lower rungs of the economy most severely. The numbers are striking. Economists: cranking numbers to answer small problems. According to Business Week: Tyler Cowen is America’s Hottest Economist. Cowen says that most economists don’t read, at least not widely. Robert Frank, who teaches economics at Cornell University, agrees. He says the ascent to tenure leads young economists toward math and small questions. Universities hold on to only the leading figures in each academic sub-specialty. There’s an idea among academic economists that the privilege of writing a narrative argument must be earned through the hard work of modeling and econometrics. Recent bad economic news has been reported as “surprising” and “unexpected” by the mainstream media. Since the news is bad, it understandably breeds low consumer confidence. 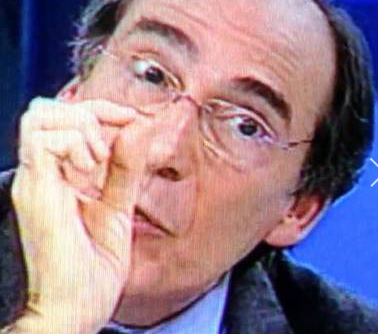 While politicos need to maintain an optimistic façade, how much damage has been done by “we’ll hold unemployment under 8%” and “this is recovery summer”? They act as if they understand more than they do and presume that their policies, whether of the left or right, have benefits more predictable than they actually are. For example, economic models, based on past relationships and assumptions, don’t capture shifts, which embody new assumptions and beliefs. So modern economics has been oversold, and the public is now disbelieving. The disillusion feeds stubbornly low confidence. Because psychology is so important, the good news is that if the economy surprises on the upside, the boost to confidence could accelerate the recovery. Tyler Cowen is America’s Hottest Economist. The George Mason University professor has written a bestseller, The Great Stagnation, keeps an influential blog, and reads way too many books. Cowen’s first rule of reading: You need not finish. His best seller, The Great Stagnation, runs through three centuries’ worth of what Cowen calls the “low-hanging fruit” of economic growth: free land, technological breakthroughs, and smart kids waiting to be educated. For developed economies. He argues, none of these remains to be plucked. Yet America has built political and social institutions on the assumption of endless growth. Cowen thinks that now that America has used up the frontier, educated all of the farm kids, and built a couple of cars for every family, we might be done growing for awhile. Cowen is still best known for his blog: Marginal Revolution. It’s the second-most popular blog on economics. Greg Mankiw’s eponymous blog at Harvard just edged it out; both picked up far more votes than Paul Krugman’s New York Times blog Conscience of a Liberal, which ranked third, or Freakonomics, at fifth. Well, to be technically correct, Jared Bernstein was Biden’s chief economist and one of the crafters of the administration’s Trillion Dollar-Stimulus plan. He fronted for the 3 million jobs saved or created. Just announced: “Jared Bernstein, the former top economic adviser to Vice President Biden, joined the Center on Budget and Policy Priorities on Monday, May 16, as a Senior Fellow”. Obama says: His economic program saved us from catastrophe. and is working just fine, thank you. Jobs affected by federal minimum wage hikes account for 41.8% of the total reduction in jobs seen since 2006. Economists warned that raising the minimum wage would result in lost jobs. It always does. As labor gets more expensive, companies pare back the employment rolls. Sure, the folks who hang onto their jobs make more … but folks who lose their jobs make less – zero to be precise. In 2006, the last full year in which the U.S. federal minimum wage was a constant value throughout the whole year, at least before 2010, approximately 6,595,383 individuals in the United States earned $7.25 per hour1 or less. 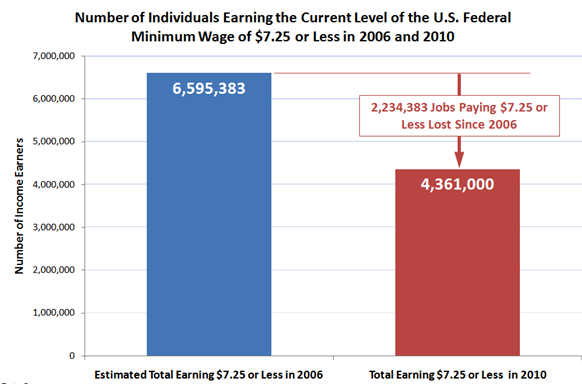 For 2010, the first full year in which the U.S. federal minimum wage was a constant value through the year since 2006, the U.S. Bureau of Labor Statistics estimates that an average of just 4,361,000 individuals in the United States earned the same equivalent of the current prevailing federal minimum wage of $7.25 or less throughout the year. In terms of jobs lost, that means that 2,234,383 of the jobs lost in the U.S. economy since 2006 have been jobs that were directly impacted by the series of minimum wage increases that were mandated by the federal government in 2007, 2008 and 2009. Interestingly, the average number of employed members of the civilian labor force in 2006 was 144,427,000. In 2010, the average number of employed members of the civilian labor force in the U.S. was 5,363,000 less, standing at 139,064,000. So, in percentage terms of the change in total employment level from 2006 to 2010, jobs affected by the federal minimum wage hikes of 2007, 2008 and 2009 account for 41.8% of the total reduction in jobs seen since 2006. Are you doing better now ? Key stats from date Obama was inaugurated until today. Yeah, I know … it’s Bush’s fault. What’s the difference between politics and economics? A fundamental difference between political decisions and economic decisions: political decisions tend to be categorical, while economic decisions tend to be incremental. That is, when the public votes in a candidate, that decision lingers and is broadly applicable. Whereas, economic decisions are more transactional. As a result, the public can end up paying as taxpayers for increments of spending that they would not have chosen to make as individual consumers. Politicians have a clear bias towards policies that will produce good results before the next election — even if they can be expected to produce bad results afterwards. That is, second stage — or second order — consequences are routinely ignored. For example, price controls may provide apparent short-term benefits, but have repeatedly shown that they ultimately constrained supply and create shortages. Another example: a second order effect of the Americans with Disabilities Act — which mandated reasonable accommodations to those with disabilities — was a decline in the employment of people with disabilities. Infrastructure spending — repairing bridges, roadways, dams, or government buildings — doesn’t provide an immediate, visible payoff. So, politicians defer spending on infrastructure unless there is some obvious defect that is both immediately visible and important to a large segment of the voting public. Political thinking tends to conceive of policies, institutions, or programs in terms of their hoped for results, not the realistically likely results. “Moral hazard” is an insurance term. People behave differently when they are insured from the way they behave when they are not insured. For example, people whose cars are insured may not be as cautious as other people are about what kinds of neighborhoods they park their car in. Similarly, when taxpayer-subsidized government insurance policies protect people against flood damage, more people are willing to live in places where there are greater dangers of flooding. Often these are luxury beach front homes with great views of the ocean. So what if they suffer flood damage once every decade or so, if Uncle Sam is picking up the tab for restoring everything? More than 25,000 properties have received government flood insurance payments more than four times. Over a period of 28 years, more than 4,000 properties received government insurance payments exceeding the total value of the property. If a property is located in a dangerous place, repeated damage can easily add up to more than the property is worth, especially if the property is damaged and then later wiped out completely. Crime … it’s simple economics. Given the Low Educational and IQ levels of many who become career criminals, crime may well be their best paying option. Crime is one of those occupations, like sports and entertainment, in which a relatively few at the top achieve very high incomes, while most of those who enter the occupation received very low incomes. For example, many ordinary young sellers of drugs on the street live at home with their mothers, often in public housing projects — clearly not an indication of affluence — but the lavish lifestyles of drug kingpins attract many young people into the occupation, in hopes of rising to the lofty level. Changes in crime rates reflect rational reactions to the cost of criminals expect to pay both in punishment inflicted by law enforcement system and the risk of being harmed by their intended victims. Another example of the Rationality of Criminals Is the Response to the unusual American Institution of the private bail bondsman a system used by only one other country, the Philippines. Criminals who use bail bondsman, usually show up for their court dates because they know the consequences can be severe. When the criminals in a given area belong to a crime syndicate, their activities are restrained by the organized crime leaders who have to take a wider repercussions into account. A syndicate may restrict the amount of crime to keep law enforcement from ratcheting up their efforts. When is insurance not insurance ? Insurance is, at it’s core, a pooling of risk. “But, political Incentives make it rational to mandate insurance coverage on things they would not be covered by insurance on purely economic grounds, since those things are not a matter of risk. For example, the cost of an annual medical checkup is not a risk, since is known in advance that these checkups occur once a year. To have health insurance covers annual checkups is like having automobile insurance cover annual state inspection checks or routine oil changes. Let’s see, the BLS reports 100k jobs added in Dec. –– pushing the unemployment rate down from 9.8% to 9.4% – giving Obama & Goolsbee fodder to crow that their economic programs are “clearly working”. According to the BLS data set, in Nov. there were 238.715 million non-institutionalized civilians age 16 and over … 153.950 of them were participating in the labor force by either being employed or actively looking for work … that’s a 64.5% participation rate, down from 64.9% in May. Of the 153.950 million … 138.909 (90.2%) were employed, 15.041 (9.8% – rounded up from 9.77%) were unemployed. Then the BLS reported that about 100k jobs were added in Dec.
OK, let’s do the math. 138.909 million employed in Nov. plus 100k jobs added in Dec. equals 139.009 employed in Dec. … which divided by 153.950 participants equals 90.3% employed … or, flipping the numbers, 9.7% unemployed … down from the rounded 9.8% in Nov. But, the Feds say unemployment went from 9.8% to 9.4% … how can that be? First, the unemployment number comes from a different source: household surveys vs. employer surveys. The household survey says that 297k jobs were added … 3 times what the employers say they added. 138.909 million employed in Nov. plus 297k jobs added in Dec. equals 139.206 employed in Dec. … which divided by 153.950 participants equals 90.4% employed … or, flipping the numbers, 9.6% unemployed … down from the rounded 9.8% in Nov. and the 9.7 based on the employer data. But, the Feds say unemployment went down to 9.4% … where’s the other .2% ? 260k unemployed people who were previously participating in the labor force by at least looking for work got sufficiently discouraged (or distracted by Xmas) that they stopped looking for jobs … so the labor pool denominator dropped to 153,690. Let’s re-do the math one more time. 138.909 million employed in Nov. plus 297k jobs added in Dec. (according to the household survey) equals 139.206 employed in Dec. … which divided by 153.690 participants equals 90.6% employed … or, flipping the numbers, 9.4% unemployed … down from the rounded 9.8% in Nov.
Bottom line: if government policies can simply discourage another 7 million people enough that they stop looking for work, we’ll have the unemployemnt problem fixed.